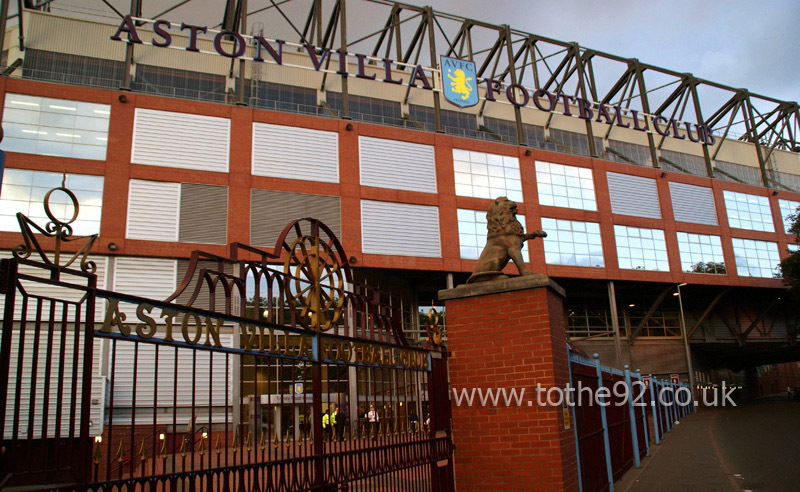 Villa Park has an enormous amount of history and has been home to the club since 1897. It's hosted 55 FA Cup semi finals, more than any other ground. There is a proposal at present to increase capacity from 42,000 up to 50,000. This would involve filling in the corners of the North stand. Interestingly, the plan was based around England's bid to host the World Cup. So it'll be interesting to see if plans are shelved as is now expected. 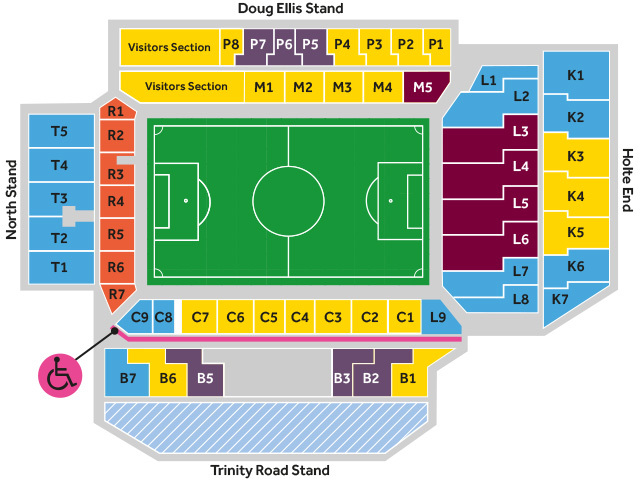 Away fans are allocated both the upper and lower tiers at one end of the Doug Ellis stand. There is a good selection of food available including pies, burgers, hot dogs, chicken, fish and chips and even now a selection of halal food. Views are very good from all areas. Near to the ground is a pub which is split half and half between home and away supporters and has it's own room and entrance for visiting fans. It is called the Cap and Gown. There is however an admission fee of £1. The pub is at the end of the road at the side of the ground, when facing the away end, it is on your right. There are many other pubs in the local vicinity but as mentioned, they seem to be members only. Car parking is limited in and around the stadium. We were lucky enough to park in the official club car park but were only seeing a reserve game so interest was minimal. There are many residential roads around although in previous experience, it may be easier to park on the far side of Aston Park and walk through. 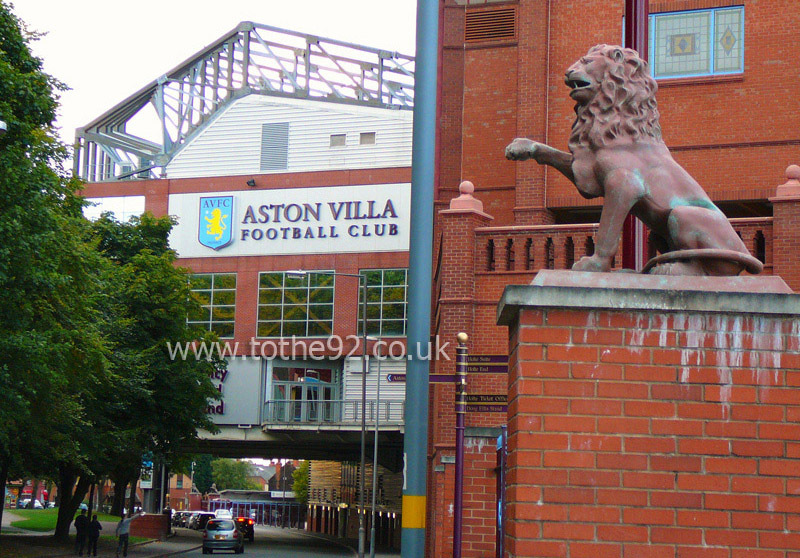 The nearest / closest train stations to Aston Villa's Villa Park are Aston and Witton mainline railway stations which are within walking distance of the ground. Both stations are around a 10 minute train journey from Birmingham's main rail station of Birmingham New Street. 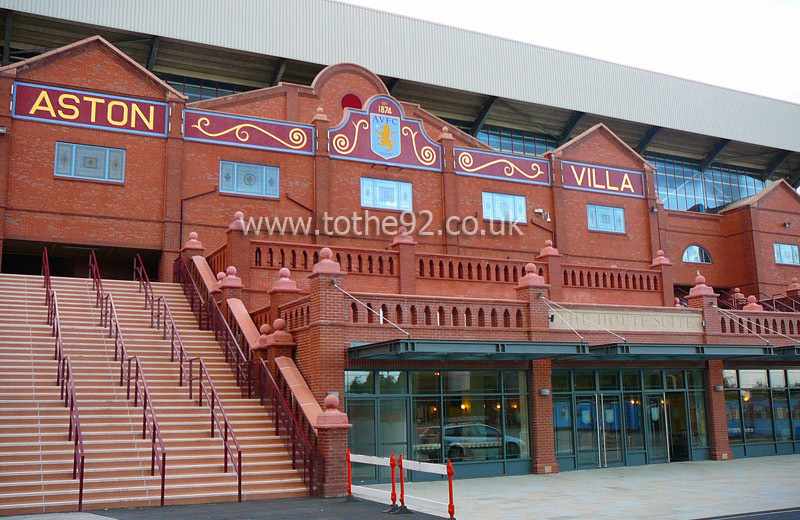 Witton railway station is approximately 5 minutes walk from Villa Park and is the closer of the 2. A left turn out of the station and left again at the roundabout and the stadium will soon come into view. Travel: I travelled by car and it was terrible around the ground, the cost for parking was an average of £5. Refreshments: There are a couple that are just for away fans but they are a rip off as they charge to get in and they are dear. There are the usual burger bars around the ground. Impressions: It is still impressive when you walk up to it and there is good seats. It has a great atmosphere every time I go. Facilities: There are ample facilities which are clean. It's not cheap for food and drink inside though. Exit: It is a long walk to the car parks and a nightmare to get on the motorway. It can take up to 1 hour to travel half a mile! Enjoy: Yes, absolutely, worth the visit. If you have the opportunity, get yourself here to see a game. Travel: After travelling by coach to both the FA Trophy Final and my first 2 official visits to Villa Park, I have drove on the last few occasions, and never had a problem. We had always parked just off junction 6 of the M6 at a PowerLeague place. It's a fair walk to the ground from there but an absolute dream getting out after the match! Last season, due to roadworks or some other rubbish, Villa advised all travelling fans to park at Perry Barr dog track. This was a bit more of a pain getting out, but as far as cost and distance from the ground went, no worse than the PowerLeague place really. Refreshments: The only pub near the ground that really accepts away fans is the Cap and Gown, on the roundabout towards Witton Station. All very well, but they now charge a stupid amount to get in, and as it's so small inside, they generally don't let anyone in once it's full (which doesn't take long). Most instead tend to just go to the off license next door and stand around! Easier said than done as the local police have got more and more over the top with each visit. Couple of fast food places in this area too, though none especially stand out. Impressions: I never thought I could find many worse away ends in as good a ground as Villa Park than the old North Stand then they moved us to the Witton Lane and it's even worse! Despite it not having the best facilities in the world, in the North Stand you could get a great atmosphere going, and although it was tight and cramped in the seats, it certainly added to the atmosphere. There's also nothing more special than getting back from the game to watch the goals on telly, and see a full end behind the goal going crazy, a la our 3-1 win in 2005! .. In comparison, the Witton Lane is cramped, too steep in the top tier, not as good for making an atmosphere as the fans are split now, and absolutely no room to move as the stand is so small as it backs onto the road. It has also ran out of food and/ or drink both times I've sat up there! They have one food outlet for a couple of thousand people, the toilets are absolutely ridiculous, and you quite simply can't move. Also on my 2010 visit, there wasn't a single steward in the end before the game telling people where their seats were! Never seen anything like that in my life, the Witton Lane Upper is an absolute embarrassment of a Premier League away end. Atmosphere: It is generally quite poor from the Villa fans, though has improved from them since the away fans were moved from behind the goal. On the downside, it has also spoiled the away atmosphere, when it was always pretty decent when we were in the North Stand. 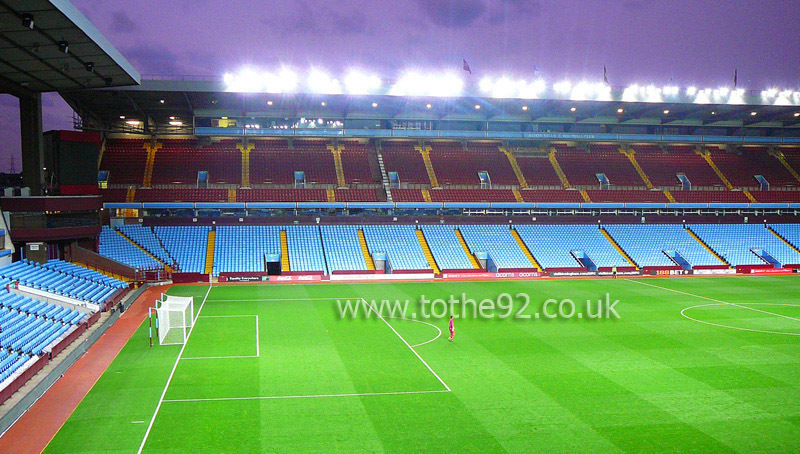 Anything Else: Mixed experiences on trips to Villa Park, but one of the most memorable for the wrong reasons was the Boxing Day game in 2005. We were embarrassing, and despite the fact the first goal shouldn't have stood due to handball, we gave up once we went behind and 4-0 flattered us disturbing when Villa were pretty poor themselves. 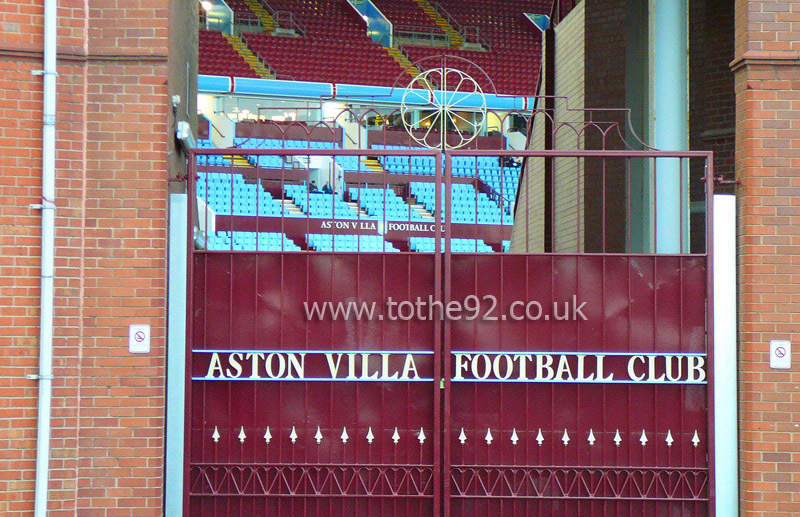 One of the other reasons I miss sitting in the North Stand though, was due to the fact that the tunnel at Villa Park is right next to that corner. We'd lost 4-0 at West Brom a few weeks earlier and the players just walked off at the end without acknowledging the fans obvious displeasure. 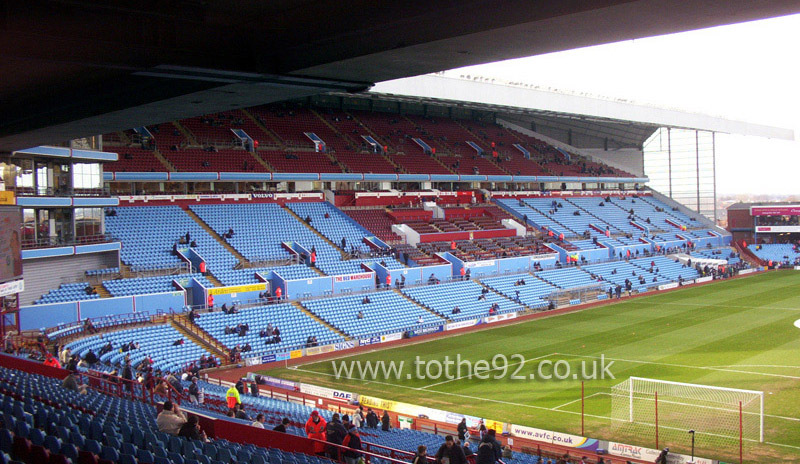 No such luck at Villa Park, as due to that tunnel being so close, they had the misfortune of being forced to face up to 4,000 freezing Evertonians apoplectic with rage that they had wasted their Boxing Day travelling down to watch this crap! Needless to say a fair few made their feelings known and the Villa stewards had a large clean up operation to do on that corner of the pitch. 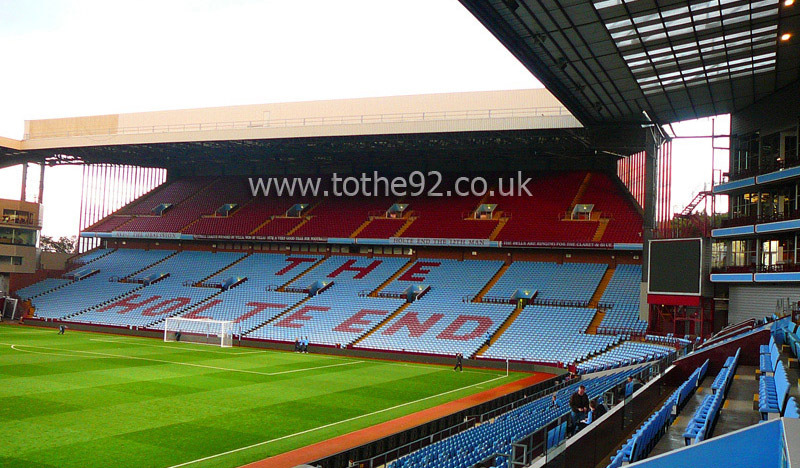 Enjoy: Villa Park used to be one of my favourite away days, but it has slowly got worse with each visit. No arguing it's a classic ground, but for away fans, it is pretty unwelcoming thanks to silly over the top policing, and now an even worse away end! 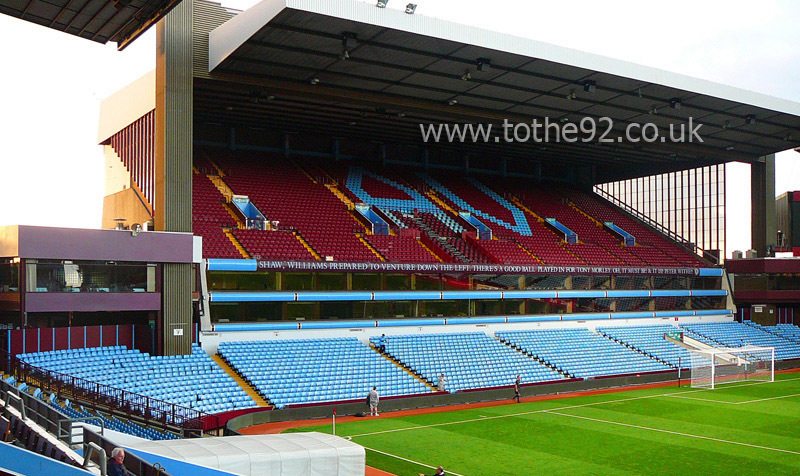 Have you been to Aston Villa's Villa Park? To tell us about your experiences and to feature on the site, simply complete the fans review form below!